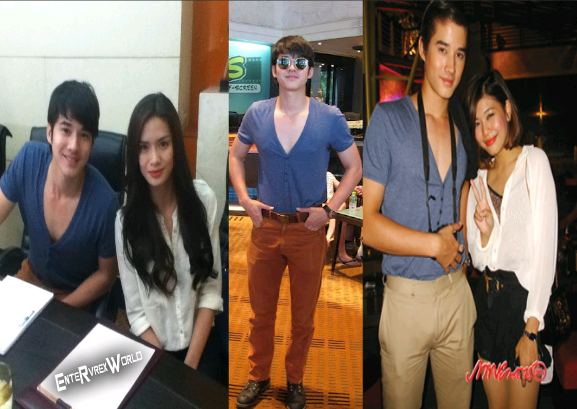 Piece of Speaks: Is Mario Maurer Seeking Attention From Erich Gonzales With His Attire? Is Mario Maurer Seeking Attention From Erich Gonzales With His Attire? Everyone is excited with the team-up of Erich Gonzales and Mario Maurer for the movie, Suddenly It's Magic and recently Erich went to Thailand to meet him for the film's story con. But one thing noticeable is what the Superstar Thai actor wore in their meeting place. Mario is wearing a tight blue v-neck shirt with long pants (left). Same shirt he wore in a picture with his long-time girlfriend, Gubgib (right). The only difference is that he put a belt on his waist (center). Well, is he seeking attention from Erich this time?! The way he dressed himself for the story conference may be a lucky charm for the Thai actor as it was closely the same apparel he wore in a picture with his current girlfriend. "Mukhang gustong maka-score ni Mario kay Erich?! Or is it coincidence lang na sinuot niya ang damit niya same with the pic with his gf?!". Gubgib (Sumontip Leuangthai) is Mario’s long-time girlfriend who is a famous actress in Thailand. But did you also notice how Erich' dress reflects Gubgib's outfit? See?! They also have same taste in wearing dress!